In 1950, squarely in the era of segregation, Swanson successfully sued UVA for his right to a graduate education. Monday afternoon’s commemoration celebrated Swanson’s courage and perseverance as a student as well as his career contributions. 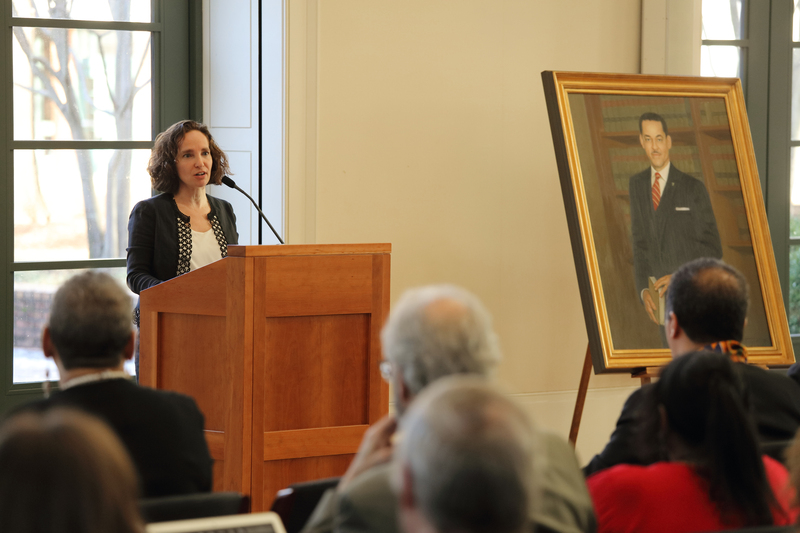 With family members of the late civil rights trailblazer in attendance, presenters revealed Swanson’s official Law School portrait, which will be on permanent display in the Law School’s Arthur J. Morris Law Library; announced an award in his name; and delivered historical remarks to a capacity audience in the Law School’s Caplin Pavilion. Goluboff noted how Swanson once wrote to one of his friends about how he would be stared at by whites as he walked the mile from where he stayed to his classes, no doubt realizing him to be UVA’s first black student. Danville native Swanson, who had earned his law degree from Howard University, was already an attorney when he applied to UVA in late 1949, with the goal of earning his master’s in law. With her remarks, Sullivan announced the creation of the President’s Commission on the University in the Age of Segregation. Its mission will be to explore and report on UVA’s role in the period of racial segregation that occurred in the 19th and 20th centuries. Rector Frank M. Conner III said the University must continue to be vigilant in its commitment to fairness and diversity. Goluboff, a legal history scholar and author of the book “The Lost Promise of Civil Rights,” said that a series of cases that rose to the Supreme Court of the United States prior to Swanson’s applying made it clear that the law was on his side. If there were no other options for a black student to attend a graduate program in one’s field within one’s state, an all-white state institution had to provide an opportunity. In 1961, he became an attorney with the Internal Revenue Service under IRS Commissioner Mortimer M. Caplin, a 1940 UVA Law graduate and one of his former UVA instructors. Swanson worked for the IRS until his retirement in 1984. At the end of Monday’s ceremony, Goluboff presented the inaugural Gregory H. Swanson Award to second-year law students Jah Akande and Toccara Nelson. The award is meant to recognize students with traits that Swanson embodied, including a commitment to justice within the community. The event was part of ongoing reflection in anticipation of the University’s 200th anniversary. UVA Law – the nation’s second-oldest continuously operating law school – was an original “department” of the University of Virginia, which was founded in 1819. It also was part of the University’s Martin Luther King Jr. Community Celebration.